Wanna make some of these star medallions for your Fourth of July Party? They don't take long, and there's some time before Sunday. 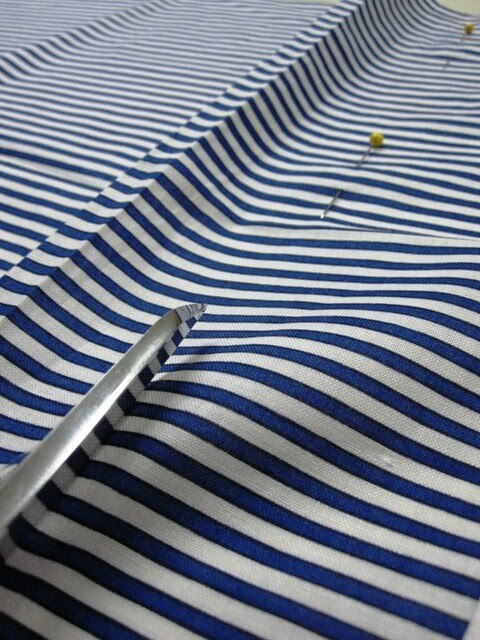 Step 1 - Cut a length of fabric. 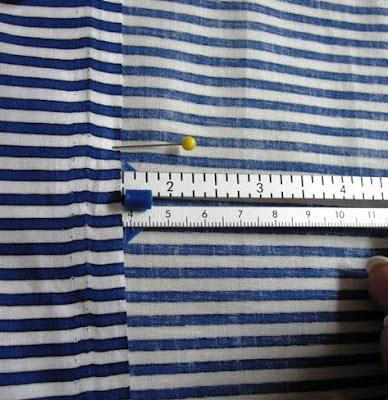 The width of the fabric will be the diameter of the medallion, and the length should be about 1.6 times the width. 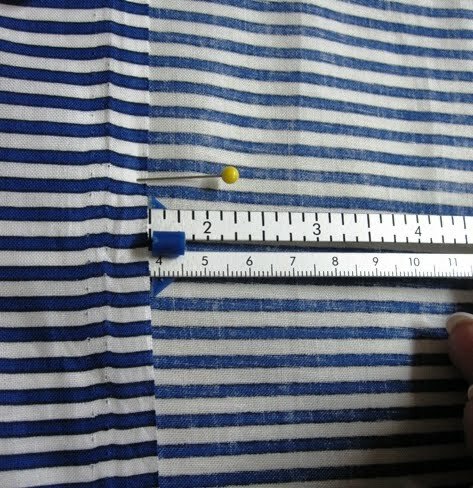 So, as Martha Stewart's directions explain here, for a 15 1/2-inch medallion (width), cut about 25 inches of fabric (length). Stripes can radiate from the center or circle out from the center, depending on the direction of your width. I did both. If you have any extra material left at the end (as I did because my folds seems to get slightly bigger with each fold), just cut away at the extra. 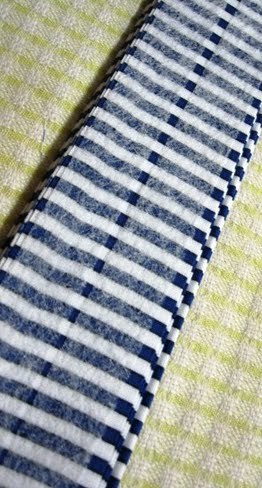 Step 2 - Fold fabric in an accordion-style at 1 1/2-inch sections. I used a sewing gauge to mark 1 1/2 inch. Then, I pinned the first 1 1/2 inch fold down so it was easier to iron. After the fold, spray starch on the fold, and iron. Continue folding the length of fabric. 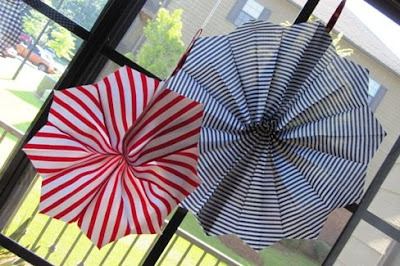 Your first and last folds should point in the same direction. Either both down or both up. 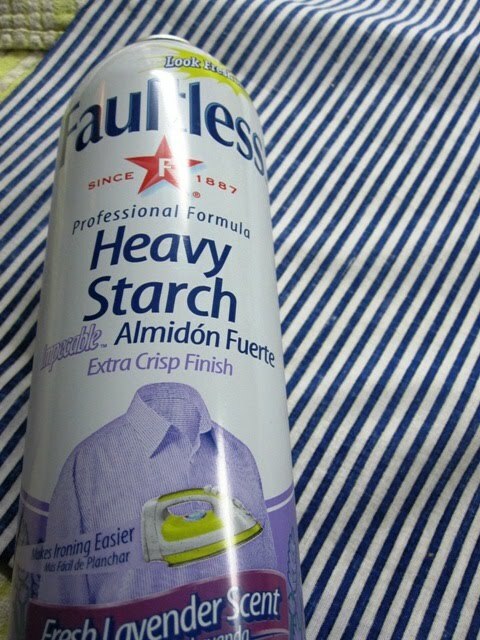 I noticed while I was ironing the medallions that this was "Fresh Lavender Scent." 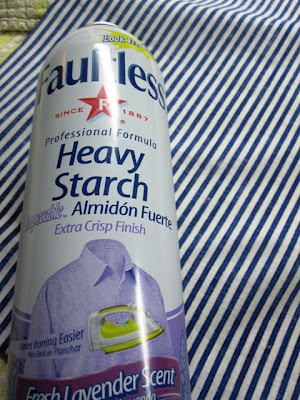 I love spray starch, but the lavender had me sneezing. Oops! Step 3 - Fold the long rectangle in half, and pinch it together so you can see the center. Then stitch along the center of the rectangle to create the pivot. 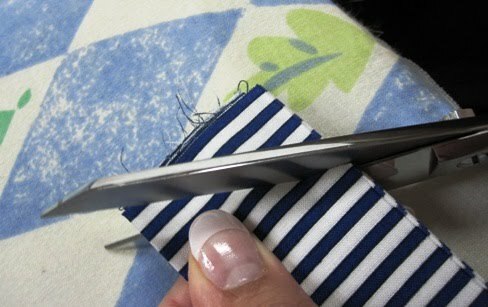 Step 4 - With your sharp scissors (or rotary cutter if you have it), trim both ends of the folded rectangle. 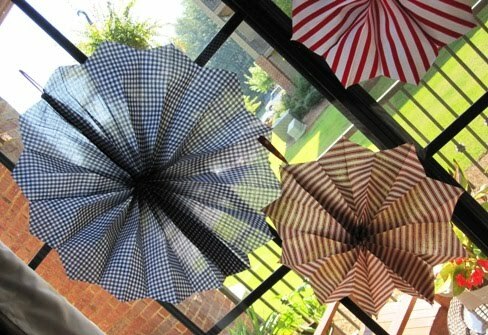 at a 45-degree angle, from the raw edge of the fabric. The easiest way to describe this: the raw edge should be in the scissors blade first. I tried different angles for a different look, and it was a total failure. Do the 45-degree angle. 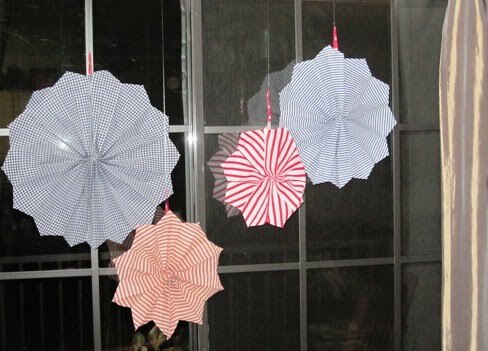 Step 5 - Here, I changed up Martha's directions a little bit. There are two ways you can do this. I'll explain both, and you can do whichever you think would be easiest for you. Non-glue: Cut a piece of ribbon that will be used to hang the medallion, about six inches, and set it aside. Cut fusible webbing the length of half the full rectangle. I used two strips to cover the rectangle side to side. 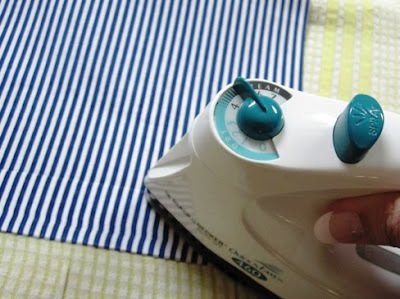 Connect the sides of the medallion by fanning the fabric over and ironing the two ides together. (This is pretty difficult - not going to lie. It's hard to iron with the pleats.) 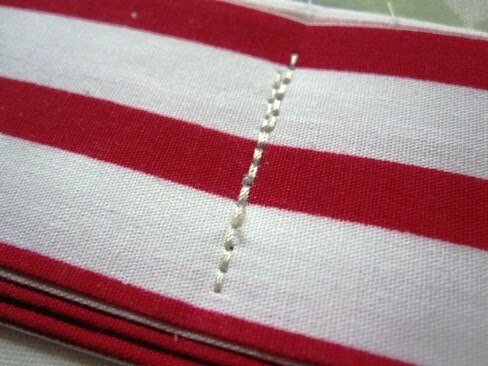 Before you iron the tip, sandwich the piece of ribbon between the fusible webbing and the medallion. 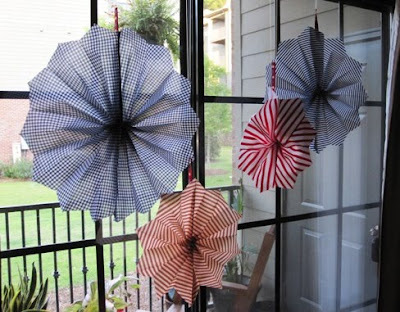 Connect the other half of the medallion with the fusible webbing. Leave out the ribbon on this side. Glue: (This is much easier!) 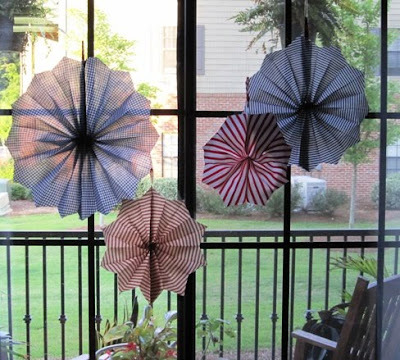 Cut a piece of ribbon to use as a hanger, about six inches; longer if you want. Heat up your hot-glue gun. Apply hot glue on one side of the folded rectangle, then fold and firmly press the other half onto the hot glue. When you get to the top, glue in the ribbon. 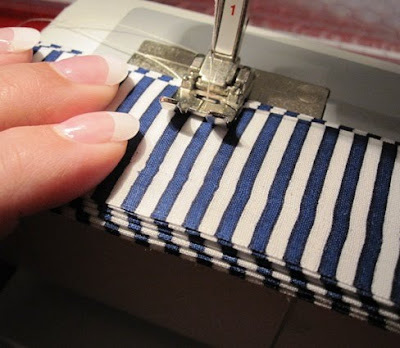 Repeat the gluing process for the other side of the folded rectangle. Step 6: Then you're done! Now just hang your medallions. I used fish line to give the appearance that the medallions were floating.